An attack on the superhuman prison the Raft by Hydra agents enabled the escape of Codename Bravo. Whle trying to recapture him, the Falcon is exposed to the madbomb. 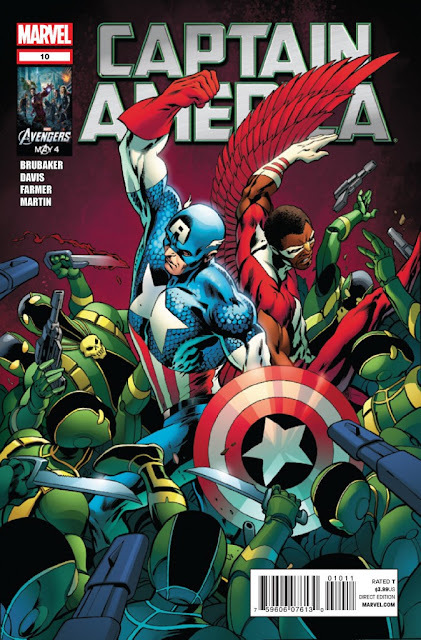 While this is going on, Steve Rogers has been depowered (again....). Sharon Carter risked her life and the helicarrier to get the information for the cure to Steve's ailment from the evil Machinesmith, offering him freedom for the cure. Will the cure work? Will Cap be able to save Falcon? What will Cap think of Sharon letting Machinesmith escape? When will Brubaker quit rehashing others work, I mean, this time we are at the heart of, I believe, Kirby's 1970s run on Cap. Finally, Steve gets his powers back. Hopefully, this will be the last damn time this happens. the artwork is very good. Davis is an excellent artist, and the colors by Martin and Inks by Farmer are very well done. The shadowing in the riot scenes with the Falcon, highlighting his crazy eyes, are fantastic. I also like the way Sharon deals with Machinesmith escaping. Very clever. Unknown to most of us, Captain America and Co. have been giving criminals who cooperate new identities and a form of super powered witness protection, with it the opportunity to reform and try to live a life free of crime. However, something from the past is throwing a wrench into the program....in the guise of "serving Justice..."
Once again, Bru goes to the "other guys" work again. The Scourge of the Underworld....again? But this time, Hydra is behind it all. But....isn't Hydra evil as well? Why would they work with Scourge? Don't know. Scourge's outfit looks lame, and Diamondback's look (the brief glimpses we get) just doesn't seem right. I don't miss all the pink, to be sure, but the brown and gold reminds me of bodily functions. Kind of like Brubaker's creativity. A new Scourge, and one who looks lame? Ugh. 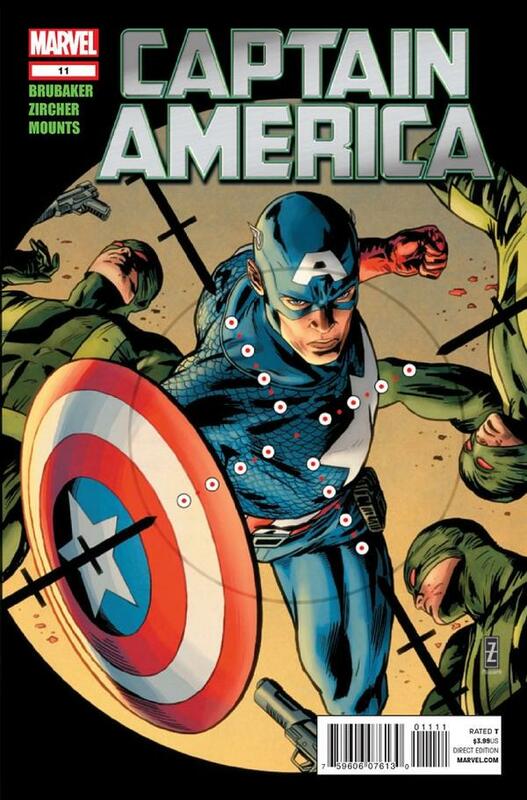 At least Cap isn't depowered or railing about how the news just lies or stuff like that, so he earns points there. Aside from the fact that Scourge is yet another recycled character idea, the story is set to be much better than what we saw in the last arc, or what we are seeing over at Cap and Hawkeye, or A vs. X, for that matter. At least we are getting back to Cap dealing with issues that boil beneath the surface. He is in the spy game but not a secret agent. He is defending the rights of those that he disagrees with. I guess the total unoriginality of just recycling Scourge will be excused in that, especially with the ties to Diamondback, this looks like it could be a very nice espionage story.